I was brought up being taught that breakfast food is sacred. Never mind syrupy McGriddles and powdered eggs — as a kid, when the smell of bacon and chorizo came wafting in from the kitchen, I knew mom meant business. When I’m unable to access mom’s home cooking, however, I have to improvise. Sometimes I opt for poorly scrambled eggs and wobbly bacon — apparently, I didn’t inherit mom’s ability to cook well — but most times I settle for a quick fix. 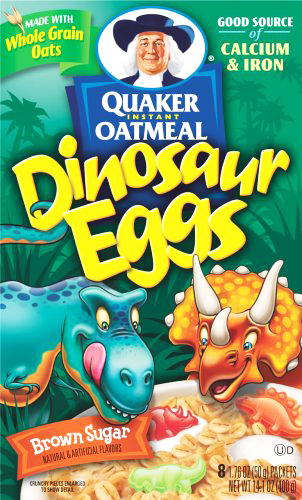 Recently, I’ve been obsessing over Quaker Instant Oatmeal Dinosaur Eggs, a breakfast food capable of satisfying your taste buds while also prompting a nostalgic childhood rush. As a Quaker Oatmeal lifetime consumer — when mom wasn’t in the mood to cook, at least Mr. Q would feed me — I can attest to the brand’s capability to produce the tasty goop that is oatmeal. Quaker Instant Oatmeal Dinosaur Eggs are more than just tasty goop, however — it’s tasty goop with an added surprise. Included are egg-shaped candies that “hatch” into dinosaur shapes when your oatmeal heats up. After emptying the packaged oatmeal contents into your container of choice, simply add milk, pop it in the microwave and presto — your tasty goop now features sugary dinosaurs to add some excitement to your oatmeal. With the same amount of calories as Quaker’s traditional oatmeal mix, Quaker Instant Oatmeal Dinosaur Eggs is a great way to get your morning going.